Our awards! The best reward! THANK YOU! 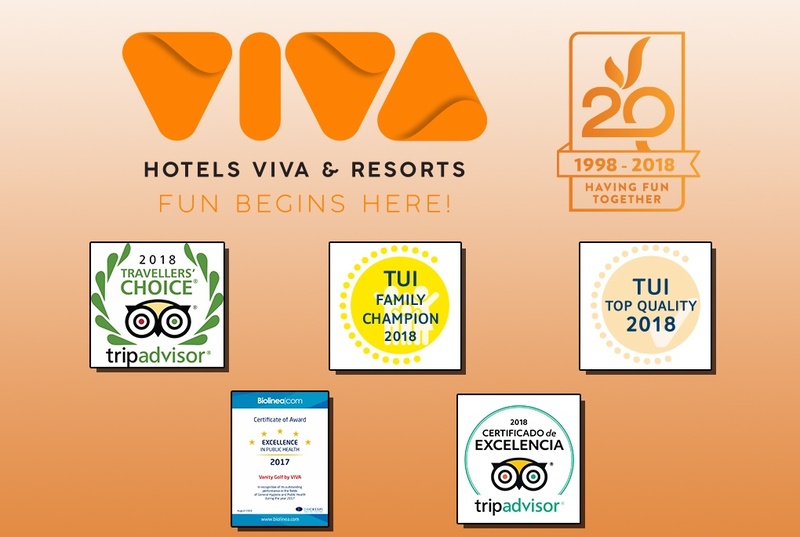 This year has been fantastic for Hotels VIVA and that’s thanks to all of you. That’s why we want you to be a part of all the awards we’ve been presented, as after all, it wouldn’t be the same without you! “Travellers Choice” is one of the most important Tripadvisor awards. This recognition is given based on millions of opinions and comments by travellers from all over the world, rating service, quality and satisfaction. If that wasn’t enough, our Hotel VIVA Sunrise is specially designed to make sure families have a great time, as it offers specific activities for kids of all ages. This means that parents can have a well-deserved rest and enjoy the island, while the kids have a great time and make friends. On the other hand, our Hotel VIVA Blue has been specially created for hardened sportspeople who want to enjoy an unforgettable holiday doing what they love. Its fantastic location right next to Parque de la Albufera makes this hotel the perfect sport for triathlon or cycling lovers. The tour operator, TUI, has recognised VIVA Cala Mesquida Resort as one of the best family-friendly hotels. This Hotel is exclusively designed so that both kids and parents alike get the best out of the island: we offer continuous activities from 10am until 6pm, all of which are adapted to kids of all ages. What are you waiting for? Bring the kids! They’ll have an amazing time while you enjoy some time with your partner. They have also recognised our Hotels Adults Only as the best in terms of quality, as both Hotels are specially designed to ensure that couples can thoroughly enjoy a peaceful, relaxed holiday by the Cala Mesquida beach, which has been declared an Area of Special Interest for its wild beauty and crystal-clear waters. At VANITY Suite & Spa we also have a Balneum, a specific service for relaxation treatments which will take you to heaven in an instant. Vanity Golf is perfect for all sports lovers who don’t want to bypass peace and body care. That’s why we’ve got a special treatment and massage area located in the Hotel, in a privileged area right on the seafront at Bahía Alcudia and just a few minutes from the golf course. If that wasn’t enough, all our Hotels have been awarded the Tripadvisor Certificate of Excellence 2018, an award given to just 10% of all businesses on the platform. This is thanks to all the positive opinions we have received continuously since 2017. If you want to get to know Mallorca and still haven’t found the perfect place to stay, you’ve already got plenty of reasons to choose Hotels VIVA. Whether you’re a sportsperson, travelling as a family or a couple, we’ve got the perfect accommodation for all you need, whatever they may be! To all of you who have enjoyed VIVA and have recommended us, THANK YOU SO MUCH!